National Journal released its 2013 vote ratings on Thursday. The ratings are based on roll-call votes from 2013 and compared on an ideological scale. Votes on noncontroversial issues and issues that fall along regional lines were not included. Below are the ten most liberal senators in 2013. The ratings were decided based on 117 votes in the Senate. Sens. Schatz, Schumer, and Murphy all received the same scores on economic, social, and foreign policy issues. The three are 93 percent more liberal than the rest of the Senate on economic issues, 73 percent more liberal on social issues, and 71 percent more liberal on foreign policy issues. They received a composite liberal score of 89.5 out of 100. Sen. Brian Schatz was elected in 2012 to fill the term of Daniel Inouye, who passed away in late 2012. Prior to his term in the Senate, Schatz served as lieutenant governor of Hawaii and in the Hawaii state house. Additionally, he was the chairman of the Hawaii Democratic Party from 2008-2010. Schatz is up for reelection in 2014. Sen. Chuck Schumer was first elected to the Senate in 1998. Schumer has spent 40 years in elected office, serving in the New York state assembly from 1974-1980 and then the United States House from 1981 to 1999. The 2014 Almanac of American Politics called Schumer "one of Capitol Hill’s most adept dealmakers." 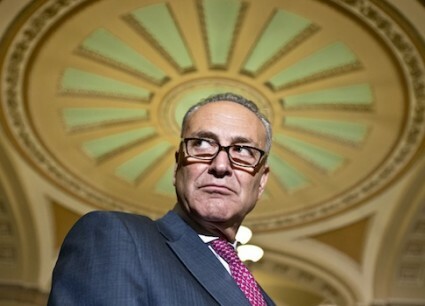 Schumer is up for reelection in 2016. Sen. Chris Murphy is the junior senator from Connecticut and was elected in 2012. He is currently the youngest person in the Senate. Murphy is up for reelection in 2018. According to National Journal, Sen. Mazie Hirono is more liberal on economic issues than 92 percent of the Senate. She is 73 percent more liberal on social issues and 71 percent more liberal on foreign policy issues. She received a composite liberal score of 88.2. Hirono is serving her first term in the Senate. She has kept a relatively low profile, but her liberal voting record led the Hawaii Tribune-Herald to say, "We wish she’d be a little more independent and less partisan"
She previously served in the United States House (2006-2012), as Hawaii lieutenant governor (1994-2002), and in the Hawaii state House from 1980-1994. Hirono will be up for reelection in 2016. These six senators are 82 percent more liberal than the rest of the Senate on economic issues, 73 percent more liberal on social issues, and 71 percent more liberal on foreign policy issues. They received a composite ranking of 86.3. Sen. Barbara Mikulski is serving her 5th term in the U.S. Senate. Mikulski attended the same Baltimore high school as House Minority Leader Nancy Pelosi. "Mikulski evinces little interest in the usual niceties of politics," the 2014 Almanac of American Politics says. "She can snap at reporters whom she feels don’t get to the point quickly enough, and at committee hearings she is a self-described "table-pounder." She will be up for reelection in 2016. Sen. Kirsten Gillibrand was appointed to the Senate in 2009. She succeeded Hillary Clinton when she became secretary of state under President Barack Obama. Gillibrand had cast conservative votes on gun issues while serving in the House of Representatives. However, she modified several of her positions that were out of step with the party after meeting with Democratic leadership. Gillibrand is serving her first full term, which will expire in 2018. Sen. Al Franken is the junior senator in Minnesota. He was elected in 2008. Prior to his political career, Franken was a comedy writer and radio talk show host. He wrote for Saturday Night Live after graduating college until 1995, when he decided to pursue a career as a political commentator. He authored the book Rush Limbaugh is a Big Fat Idiot and joined the liberal Air America Radio network. Franken is up for reelection in 2014. Sen. Maria Cantwell is serving her third term, having been elected in 2000. Cantwell previously served in the U.S. House from 1992 to 1994, and the Washington state House from 1986-1992. She will be up for reelection in 2018. Sen. Richard Blumenthal was elected in 2010 to his first term in the Senate. He is one of the richest members of Congress with a net worth of up to $121,299,056. Blumenthal served in both the Connecticut state House and state Senate. He was Connecticut’s attorney general from 1991-2010. He is up for reelection in 2016. Sen. Tammy Baldwin was elected to her first term in the Senate in 2012. She has a consistently liberal voting record. Her win in the 2012 Democratic primary is attributed to her support of abortion rights. Pro-choice group EMILY’s List helped her raise about a quarter of her $1.5 million campaign chest, according to the 2014 Almanac of American Politics.